Cambiare Young Men’s Chorus is designed to help singers navigate through their voice transition in a positive, lively, and healthy way. Singers learn a variety of diverse repertoire, selected carefully and intentionally to support and build up the singers. Rehearsals are active, upbeat, and fast-paced. Cambiare members participate in CYC’s two major concerts, two final dress rehearsals, a yearly retreat, and an outreach performance. 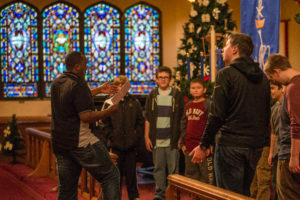 Singers are promoted from Primo Choir or are placed in Cambiare Young Men’s Chorus following a required placement voicing. A second voicing will occur mid-year to reassess if the singer should move into the CAAM Men’s Choir. Cambiare meets August 26-December 2 and February 3-May 5.